This simple knitting pattern guides you through making cable knit ear warmer headbands in four sizes with step-by-step instructions. Order here to download, save, and print a PDF of this pattern. Learn to knit a cable ear warmer headband. These headbands are great for chilly days, keeping you comfy and cozy. They also make excellent pony tail hats, allowing you to wear your hair up in a pony or bun and still keep your ears warm. This easy to follow knitting pattern walks you through how to make these headbands, with row by row written steps. Comes with instructions for woman, child, toddler, and baby sizes. 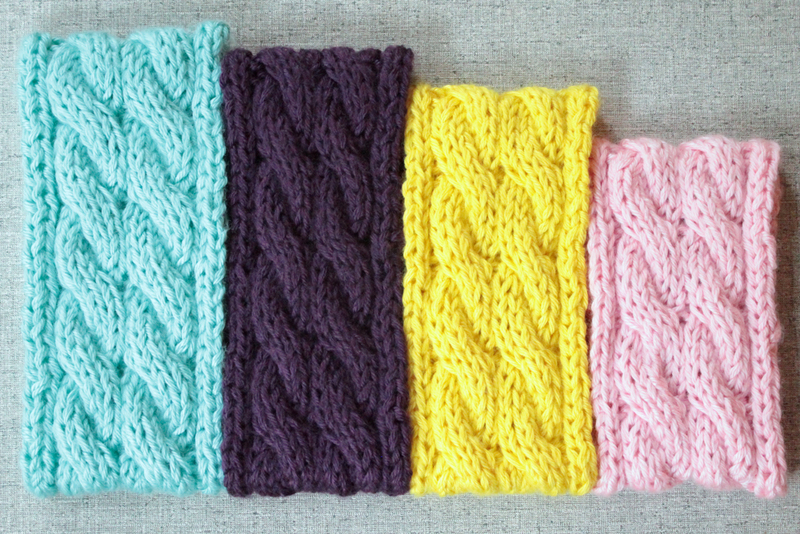 You will make these cable ear warmer headbands with Caron Simply Soft Yarn. Or, substitute any brand of worsted weight yarn in any color. The headbands are worked flat, then sewn into a seamless circle at the end of the knitting process. They are double-thick, so you’ll work with two strands of yarn at a time. This is an intermediate knitting skill level pattern that requires a general understanding of knitting in the round, double point needles, increases, and decreases. To make this ear warmer seamless, you will also need a good understanding of the Kitchener’s stitch. You’ll learn to make cables with the written instructions in this pattern, and you will need a cable needle to follow along. Please note there is no cable chart included in the pattern, as I find it confuses matters when simple written instructions are clear. – Woman size fits most adults and teens, or heads measuring 21 to 23 inches around. – Child size fits most children ages 3 years to 14 years, or heads measuring 18 to 21 inches around. – Toddler size fits most children ages 3 months to 3 years, or heads measuring 16 to 18 inches around. – Baby size fits most infants from birth to 3 months, or heads measuring 13 to 16 inches around. If you use the materials suggested in this pattern, your final product will be machine washable. To keep your headbands looking their best, hand wash or machine wash separately on delicate cycle in cold water. You may tumble dry on low heat, but laying flat to dry is recommended. This listing is for a digital download of my knitting pattern, and is not a physical item. You will be able to download a PDF file immediately after your purchase has been processed. If you have any trouble with your order, please email purlsandpixels@gmail.com.